This cookie is the first Christmas cookie I ever made when I was a kid, and they have been a family favorite since then. Preheat oven to 375 F. Mix butter sugar, egg, and flavorings thoroughly. Add flour and salt, Mix well. Shape dough into a disk and wrap with plastic wrap; chill for at least 2 hours or until easy to handle. Roll into 4 inch strips; place on baking sheet. Curve top down to form handle or cane. Bake 9 minutes. While still warm, remove from pan and sprinkle with candy and sugar mixture. 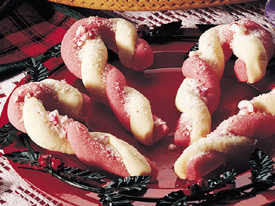 Dough may be divided in half and colored with 1/2 teaspoon red food coloring if desired. Roll each color into strips, place side by side, press together lightly and twist like a rope. For more fun recipes visit The Grocery Cart Challenge ! I hope you're bringing some to MN with you! yum! These are a family tradition in our family as well. I remember my grandmother making them for us. they have been on my cookie list every year and I never seem to get around to them. I need to make them this year so my kids can love them too!